SportsBetting.ag has been around since they first opened up shop in 2003. Their license to operate is held in Panama, and they’re operated by the BetOnline Group. 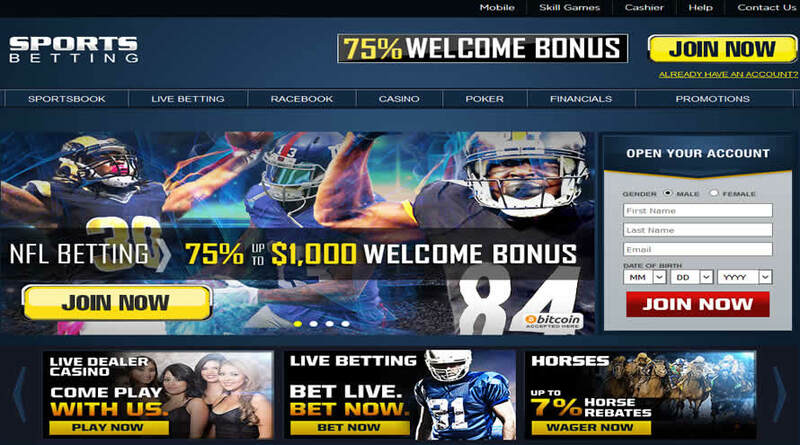 The main thing to understand is that this site has been around for the majority of the history of the online gambling industry as a whole, and they have proven themselves to be reliable all-around on a consistent basis during that time. They also accept bitcoin and US players, which makes them perfect for players who want to use this crypto-currency for the benefits of security and staying anonymous while keeping safe, reliable transactions. There are different offers available here for the different types of gambling you might take. On the sportsbook, you can pick up 50 percent added on to your initial deposit by using the SB50 promo code, worth up to a maximum of $500. There’s a simple 8x wagering requirement before you can cash out. You can use the FORLIFE coupon code on every deposit after that to get 25 percent added on worth up to $1,000 per shot. The play-through is a lower 6x for this offer, and it adds up to a great bonus on every deposit you make after your first one for the entire length of your account. On the casino side, players can earn a $25 free chip for their live dealer games on their first real money bet. There’s a simple 6x play-through for this offer. Players can also earn a 25 percent reload bonus using 25RELOAD with a 50x play-through requirement on all games but craps, roulette, blackjack and Baccarat. Alternatively, you can use 100SLOTS to get a 100 percent match (with a $100 minimum deposit) for playing slots only, but this does not include mobile games. The wagering requirement is 50x on this offer as well. Finally, online poker fans can pick up 200 percent worth a maximum of $1,000 when they first deposit. This bonus is released in five different parts based on earning a certain number of loyalty points at the games. There are also a variety of cash races, guaranteed tournaments, freerolls and other leaderboard type events that happen on a monthly basis to help you to keep your bankroll topped off. All of these offers and some other special deals can be claimed with bitcoin based on the current exchange rates. The online casino at SportsBetting.ag uses the BetSoft software package. This software is known for combining extremely high-quality games with quick loading speeds through an instant play platform. This instant play platform runs in your web browser, and that helps to make it particularly flexible in terms of what kinds of computers and operating systems you can use with it. All of their games can be played with bitcoin, and players can get in on the action with computers that use Windows, Mac or Linux. You can also connect through your web browser on a smartphone or tablet to play that way if you’d like, and the type of phone or mobile device you have doesn’t matter. In terms of game selection for the online casino, it’s mostly online slots, which are what BetSoft is primarily known for. These are regularly voted as the games with the best visuals in the industry, and they cover a variety of formats with different themes and features as well. In terms of table games, they have a good mix of titles like roulette, Baccarat, blackjack, video poker, etc. There’s a bit of depth, but because most of their focus is on slots, their table game selection is more about covering the basics. Their software for poker is a downloadable platform only, but they have versions for both Windows and Mac to keep things as flexible as possible. If you run a Linux-based machine, you should have no problem running the poker client in the Wine emulator for Windows. This software is based on the proven best practices for online poker clients that have been tested over more than a decade of work, and this includes multi-tabling capabilities, easy bonus management, simple chat interfaces and the ability to replay hands to study the play of yourself and your opponents. There are three main styles of poker available here: hold’em, Omaha and Omaha hi/lo. You can play hold’em in the fixed-limit, pot-limit and no-limit betting formats, but the two Omaha games are only available in pot-limit and no-limit. Along these lines, there are also cash games, multi-table tournaments and single-table tournament events available for all of those game variations, so players can get in on the action with the most popular forms of poker in the world in the format that fits their own personal preferences. Games are typically available up to the $5/10 levels for hold’em and up to the $2/4 and $3/6 levels for the Omaha games, depending on peak hours and which day of the week it is. All of these games can be played with bitcoin converted to USD for the purposes of having the same currency in the games. With a name like SportsBetting.ag, it’s probably not surprising that this site has a great online sportsbook. They have a simple, web-based interface that gives players an easy way to navigate through different sports to find different leagues and markets. There’s also a search function that makes it ridiculously simple to find the exact teams and games that you’re looking for, so there’s never any of this browsing endlessly to find a specific game. Decimal, fractional and American odds are all available from a simple pull-down box, and they run money line and every other common betting standard for baseball, basketball, American football, hockey, soccer (football), tennis, boxing, MMA, Olympic sports and plenty of other contests. They also have regular promotions for specific events that will give you better effective odds that you’d get otherwise under most normal circumstances. Because all of these contests can be wagered on with bitcoin, you’ll have no problem using this crypto-currency to get in on the action whenever you want. Bitcoin is accepted here for deposits and withdrawals, and it has the lowest fees of any of the available banking methods. You’ll also get your withdrawals faster, on average, with bitcoin compared to any other payment option. Aside from that, they accept credit cards like Visa, MasterCard and American Express. They also accept other methods like MoneyGram, Skrill and Neteller. A handful of other options are available, many of which depend on where exactly you live, but they have a long history of reliable withdrawals no matter what method you use. There’s a really great, well-trained group of people who operate the online customer service desk for this online gambling site, and they have been particularly trained to help you get back to your normal experience as quickly as possible. Besides having friendly service and quick response times, they have also been trained to help you to make bitcoin deposits and withdrawals, even if you have absolutely no idea how to do any of it. They’ll walk you through everything, step-by-step, to help you with whatever you need. You can contact them through email, live chat or telephone. SportsBetting.ag has a lot to offer as a sort of one-stop shop for gambling online. With an online poker room, a sportsbook and a casino, you can jump from one type of gambling to another whenever you want with no issues whatsoever. What’s more is that since all three of the parts of their operation accept bitcoin, you’ll have no problem using this crypto-currency to get in on the action.